These last couple of days have been a little blustery on Ocracoke. Overwash commanded the "S" curves in Rodanthe on Hatteras Island at high tide, and the road closed down for a number of hours. This weekend, birders flocked to the island (okay, only the ones who could fly here or arrive by the mainland ferries), for the annual fall bird count. The Ocracoke count was started by Peter Vankevich and Bob Russell back in 1981; and they added Portsmouth Island in 1988. There will also be a Christmas bird count on Ocracoke and Portsmouth. Those interested in participating can contact Peter Vankevich at 202-468-2871 or petervankenich@gmail.com. You don't have to be an expert in birds . . .beginners will be placed with more experienced birders. 1415 S. 17th St., Wilmington, NC, 28408), at 8:00 PM, to celebrate the release of John's "Minstrel of the Times" album. Tickets are $15 for adults and $10 for students and seniors. John recorded the Minstrel album at Gary Mitchell's Soundside Studios on Ocracoke with a some back up instrumental help from Molasses Creek members. Gary Mitchell, Fiddler Dave, Marcy Brenner, Lou Castro, and Gerald Hampton will lend their support during the first half of the concert and then perform a set of Molasses Creek favorites. Take a listen to track samples below. After the Friday night concert in Wilmington, Molasses Creek will be heading to Southport, NC to perform at 7:00 PM on Saturday night at Playhouse 211 (located at 4320 Southport Supply Rd Suite 1 St James, NC 28461). For tickets contact Ken Perrin at keyfla@gmail.com or 910.274. 3971. This year’s Ocrafolk School was the best ever! Well, that’s what we all keep saying, but we said that last year too; and the year before that also. Come to think of it, it’s been said every year -- and every year it’s just as true. This was a spectacular year at Ocrafolk School. 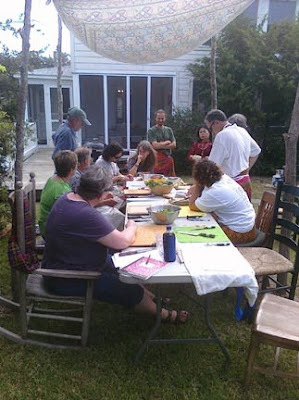 Classes in Island Photography, Beginning Jewelry Making, Island Cooking, Ships In Bottles and Ocracoke Sampler were offered the last week of October 2010. 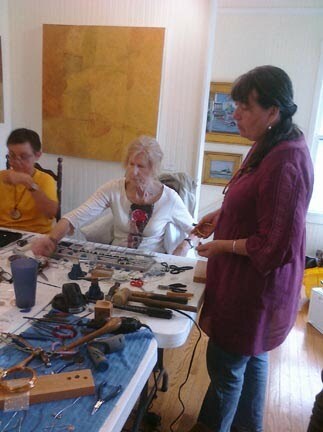 The newest class was Beginning Jewelry Making by Barbara Hardy of the Secret Garden Gallery. The class location could be easily found by the tap-tap-tapping of little hammers on miniature anvils, flattening silver into heirloom pieces of jewelry. Ann Ehringhaus taught island photography and they focused on life around the school activities, providing a unique perspective of the common things around us during the week. Debbie Wells taught island cooking with a record number of local students (most of them men) and invited Moon, of the local Thai Moon restaurant, to teach a session on Thai dishes. 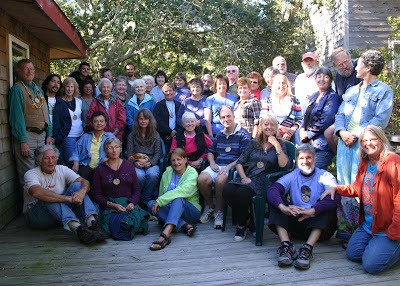 The popular Ocracoke Sampler class took a trip with Dave Frum to Portsmouth Island, went clamming with Philip and, among many other activities, sailed the Windfall II with Rob Temple. Something was said about meal wine, a pizer (porch) and ghost stories but no one’s telling the whole story. 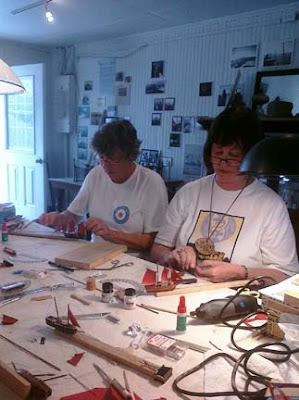 Jim Goodwin taught Ships in Bottles (all women) in the picturesque building that houses the Working Watermen’s exhibit on the docks of Silver Lake. Only the resident cat knows the secrets of how they got those ships and lighthouses into those bottles, and what happened to all the whiskey. There was great food, lots of music, laughter and friendships cast and bonded; our mutual love of our island home fully celebrated. 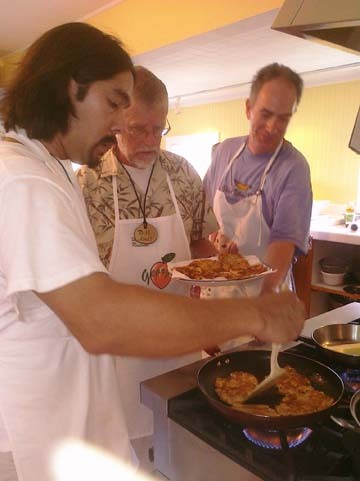 More information about Ocrafolk School can be found on the web at www.ocrafolkschool.org.